One of the most surprising discoveries in recent years in the outer Solar System is that there are small moons which have oceans inside them. Jupiter’s moon Europa and Saturn’s moon Enceladus are now known to have global oceans of water beneath their icy crusts, and others are thought to as well, including Ganymede, Titan, and possibly others. These moons have a lot of ice and rock as well, and gravitational tugging and heating from the large gas giant planets helps maintain a deep layer of liquid water inside them, where otherwise they would most likely be frozen solid in the deep cold so far from the Sun. Now it seems that another moon also once had an ocean, although in this case it is thought to now be solid ice: Pluto’s largest moon, Charon. The findings suggest that there used to be an ocean below Charon’s surface, but it has long since frozen, with the expanding ice causing the surface to stretch and fracture. Evidence of this can be seen all over the moon in images taken by the New Horizons spacecraft during its flyby of Pluto last summer. Ridges, scarps, and valleys reveal a history of tectonic activity on this small world; in some places, the valleys can be 6.5 kilometres (4 miles) deep. It is a surprising amount of geological activity for such a tiny and cold body in the outer fringes of the Solar System, in the Kuiper Belt. Radioactive decay of elements as well as some internal heat left over from the moon’s formation would have helped to keep a layer of liquid water beneath the surface, but eventually it would have cooled down with little or no other sources of heat available. 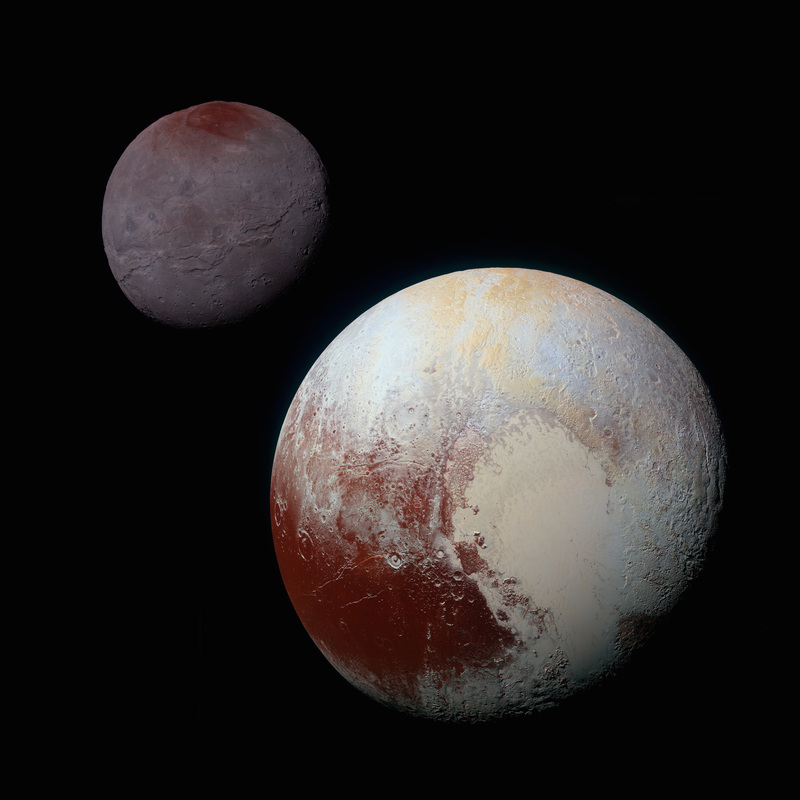 Pluto and Charon are mutually tidally locked, orbiting a common center of mass (barycenter) as a “binary planet,” so gravitational tidal heating is unlikely or at least would operate differently than with an icy moon orbiting a gas giant planet. Since water expands when it freezes, it kept pushing outward until Charon was almost “bursting at the seams.” This led to fracturing of the surface that dwarfed even the Grand Canyon on Earth. Serenity Chasma, part of a vast equatorial belt of chasms on Charon, is at least 1,800 kilometres (1,100 miles) long, with chasms 7.5 kilometres (4.5 miles) deep. The Grand Canyon is only 446 kilometres (277 miles) long and just over 1.6 kilometres (one mile) deep, by comparison. That is incredible geological activity for a body much smaller than Earth. Also, Charon’s ocean may be frozen now, but youthful-looking regions on the surface suggest that geological activity there continued for a long time, and perhaps even still does. As posted earlier on AmericaSpace, there was also a previous study, from before the flyby, which suggested Charon once had a liquid subsurface ocean. Another interesting feature on Charon is the “mountain in a moat,” an unusual depression in the surface, with a large mountainous block sitting inside it. 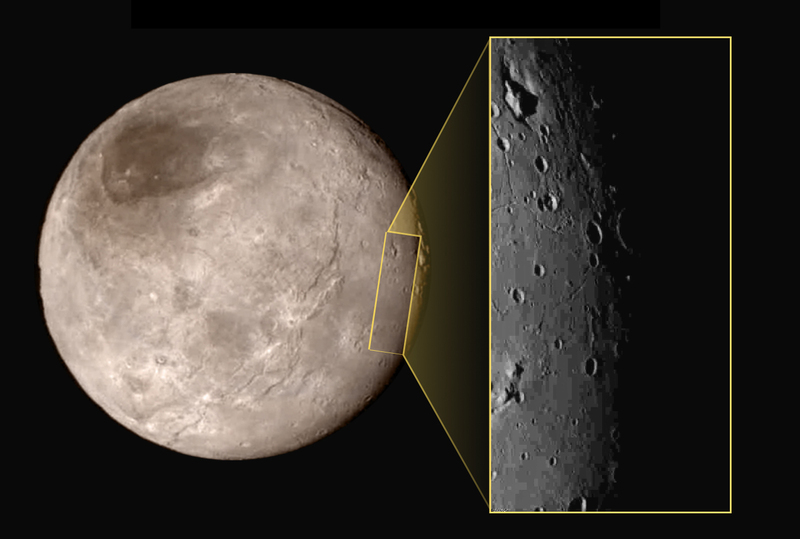 Geologists aren’t yet sure how this feature formed, but it does provide more evidence for Charon being a more geologically active place than first thought. As also recently reported, Pluto itself has seas of sorts on its surface, notably the Sputnik Planum region, but they are frozen nitrogen, not water ice. There are, however, “icebergs” of water ice which “float” in this frozen sea. 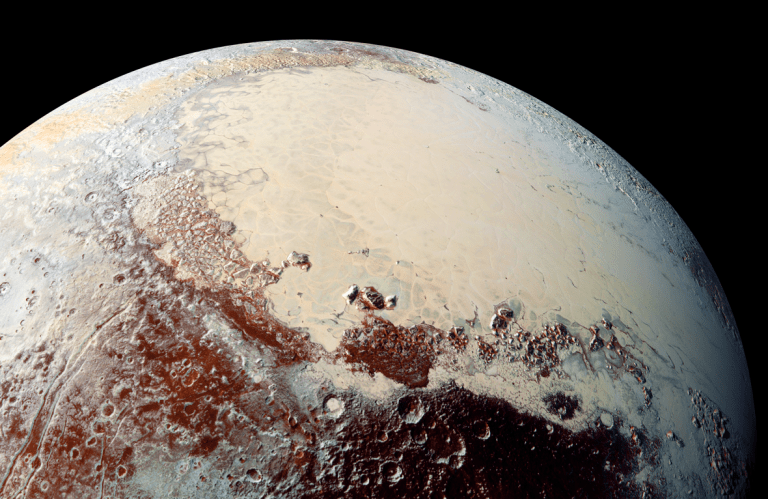 At Pluto’s extremely cold temperatures, the nitrogen ice flows very slowly in the same manner as glaciers on Earth. 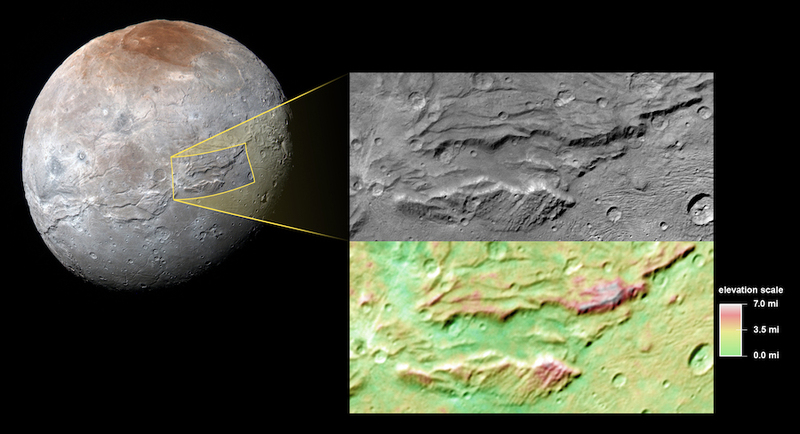 The “coastline” mountains are also composed of water ice, which on Pluto is as hard as rock. It is another example of processes which can mimic those on Earth, but in some cases, involve completely different materials. The frozen nitrogen is thought to gradually rise up to the surface from below, sort of like what happens in a lava lamp. This creates a surface marked by distinct “convection cells” divided by troughs. In places, the surface is also covered in many small pits, also thought to be linked to the convection process. There is also now a new geological map of Pluto, showing Sputnik Planum and surrounding terrain, covering 1,290 miles (2,070 kilometers) from top to bottom. All of the terrain has been imaged at a resolution of approximately 1,050 feet (320 meters) per pixel or better. It illustrates how Pluto has been more geologically active than many scientists had anticipated, along with Charon. But not just in the past—a complete lack of craters in regions such as the Sputnik Planum ice sea and flowing glaciers indicate that Pluto is still geologically active even today. Charon’s ocean may now be frozen, but even just the fact that it used to have liquid water below the surface is a fascinating discovery. 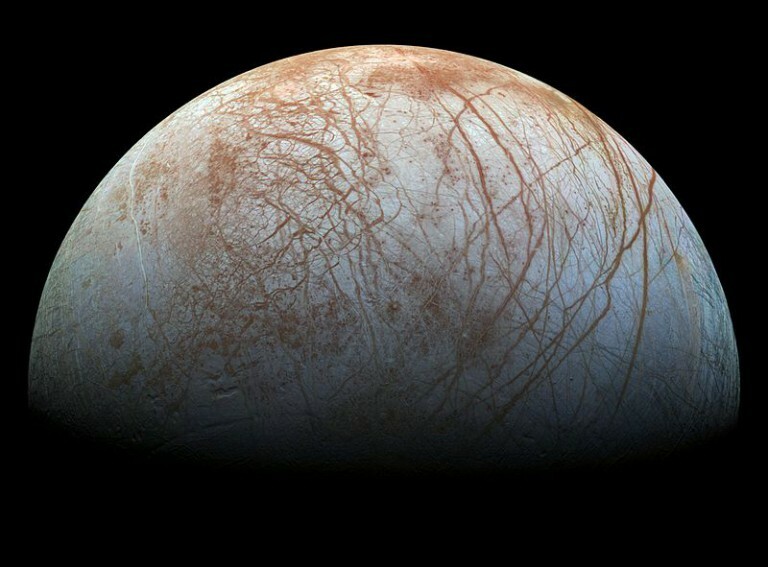 Whether there was any time, or the right conditions, for any sort of life to develop is completely unknown at this point, but the finding, along with moon such as Europa and Enceladus, suggest that there may be many such “water worlds” out there. If they are relatively common in our own Solar System, what about all of the other exoplanets and solar systems in the universe? 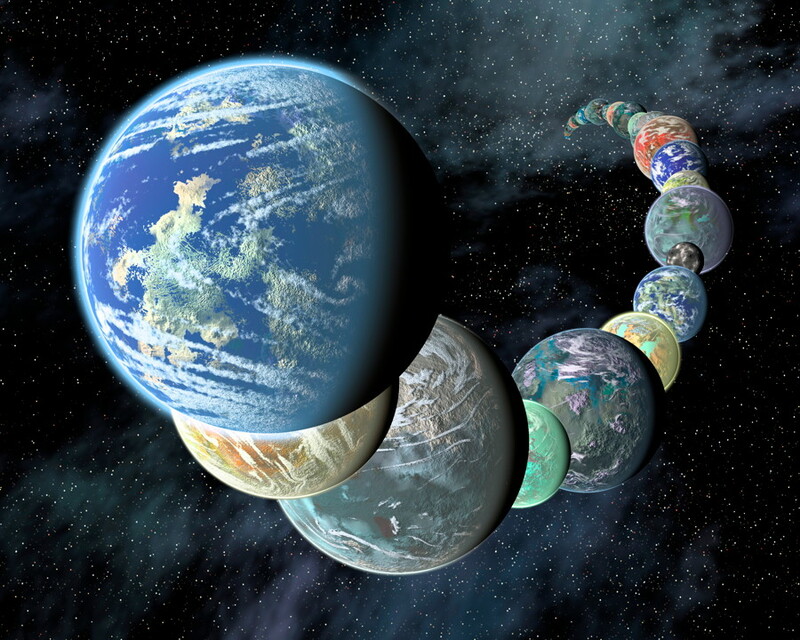 Exoplanets are now being found by the thousands, with billions estimated in our Galaxy alone. What about all those other moons which are likely just as common? The findings at Charon and Pluto also provide important clues as to what else may be waiting to be discovered on (or in) other objects in the Kuiper Belt. As so often seems to be the case, our Solar System is full of surprises.